Videogames have certainly come a long way from their Pong roots. From ticky-tack graphics to fully computer animated action, videogames are becoming more cinematic. But not only more cinematic, they are also becoming more interactive and immersive. 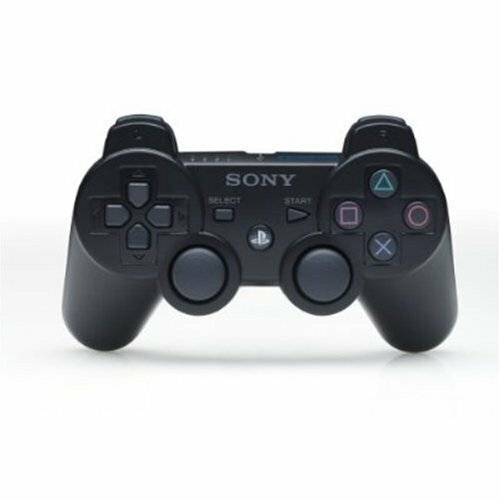 For those seeking an immersive experience while playing videogames, the DualShock 3 Wireless Controller is a great controller for the PlayStation 3. Not only is it motion sensitive with its SIXAXIS capabilities but it also rumbles with action onscreen adding to the suspense and drama onscreen. The DualShock 3 Wireless Controller features pressure sensors that rumble to varying degrees that correspond to action within the game. If you’re playing a driving game, depending on the type of car you will feel the controller rumble much the same way you would feel as if you were actually driving. Sure it’s not like grabbing a steering wheel but it adds to the level of realism and is one step closer to putting the player within the onscreen world. It can also heighten suspense. The controller won’t make a rumble at all until you’re caught in a tight spot just to jolt you and make you more anxious. These kinds of extras are now expected in games and when a controller does it as well as the DualShock 3, it only heightens the gaming experience. Not only does the rumble function heighten the interactivity of the game but the SIXAXIS controls add new dimensions of control in games. Much like the Nintendo Wii, it is a type of motion control though not quite. The Nintendo Wii is fully motion controlled. You’re not pointing a wand at the screen with the DualShock 3. You’re still holding a controller but if you veer left in some games, your character will veer left. It just adds more precise controls. Only some games utilize this feature and truthfully it is a tricky feature to get the hang of. It seems more suited toward racing games and steering and even then, I don’t see myself using it all that much. If there’s an option to turn it off within the game I’m sure I would. The games that have had it like Grand Theft Auto IV didn’t utilize it very well and I just opted for the standard controls. Uncharted: Drake’s Fortune made it within the game for balancing your character on logs and there was no option to turn it off. It was utilized well in this game and it really heightened the experience. If it’s used minimally, it can be done well but overused it can be annoying. If you were an early-adopter of the PlayStation 3 and you just got the SIXAXIS controller packaged in, you really should upgrade to the DualShock 3. It’s $54.99 and it truly is a game enhancing accessory. There’s no reason it shouldn’t be in your collection.